That’s where this holy WOW, crazy, crazy chocolatey mac-nut pie comes in. With its salty and crispy macadamia praline crust, and the devilishly rich dark chocolate cream filling, it is sliding in for a homerun in this little game I have been playing called, “Pretend I am still in Maui”. It’s a fun game and whether you have been to Hawaii or other tropical paradise or not, you can still play along. You must get the following materials together for this game: #1 Set up Pandora for Hawaiian music, #2. Make a very awesome Mai Tai, #3 go here for a fresh Ahi Poke salad recipe and have that at the ready (super simple and tasty) and finally plan ahead and make this dream worthy mac-nut pie. More than any dessert in the world (well minus this one perhaps), it shouts “ALOOOO-HA!” from the rooftops and sends you to a transcendental place that usually only comes from other things. It was one of the best two things I ate on Maui and I ate ALOT of superb food. This particular little doozy was found at Leoda’s Kitchen and Pie Shop known for its executive chef, Sheldon Simeon (Of Food and Wine and Top Chef fame). Of course, I rushed home to replicate this pie because that is just the kind of excellent service I provide over here at Sweet and Crumby. I am nothing if not a giver. I served it to our Sunday Dinner focus group who I affectionately refer to as my family (all 12 of us) and not a soul hasn’t mentioned this pie’s deliciousness. I don’t think there is honestly a better bite in the world than the bite that is created by forking into the crispy macadamia praline crust, deep chocolate creamy middle and the fresh whipped cream top with sprinkles of chopped macadmias and dark chocolate shards. Your eyes may roll back and your guests will assuredly ask for another slice and before you know it there will be none left for breakfast the next morning. Dammit. Last sliver of pie with melting whipped cream and suspicious bite missing. That’s how good it is. Maybe you should make two pies or just one for yourself and hide it from view. Yes, I think that is the answer. —P.S. Bloggers’ note…this is an especially important pie to take pics of BEFORE ANYONE GETS THEIR HANDS ON IT or otherwise you will end up with one droopy leftover pie slice with one suspiciously large missing bite taken out of it—hence photo above. This very rich pie serves about 12-14 people. Tiny slices are in order here due to its intensity. Garnishes: chopped Macadamia nuts and grated bittersweet chocolate or see here for a step-by-step how-to on making chocolate shavings. To make the Crust: Preheat oven to 350 degrees Fahrenheit. Place pecans and Macadamia nuts on cookie sheet and roast for 10 minutes. Toss them around during the baking process every so often. Remove from oven and let cool for 5-10 minutes and then place in a food processor and pulverize to crumb texture. Pour out crumbs and save in a medium-sized mixing bowl. Put approximately 20 squares of graham crackers in the food processor (break them up by hand as you put them in) and pulverize. Measure to make sure you have 2 cups…if not throw more grahams into the food processor. Scoop into mixing bowl with the nut crumbs. Stir together graham crumbs and nut crumbs. Melt butter in microwave (about 30 seconds or so) and add brown sugar and melted butter to the crumb mixture. Stir until the mixture comes together. 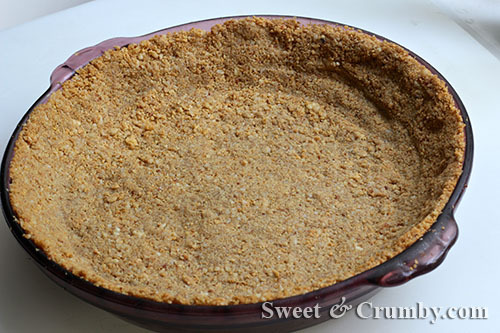 Press into an ungreased pie plate, making sure to evenly press crumbs up the sides. Use wax or parchment paper to press down on the crumbs to flatten crumbs and compress mixture evenly. You can even press the back of a large measuring cup onto the wax paper to try to flatten the crust. Bake for 15 minutes in the 350 preheated oven. Let cool while making filling. To make the filling: Chop you chocolate and butter and have them ready for later. Separate your nine eggs and place them in a bowl and whisk them together. Set aside. In a small bowl, using a whisk, whisk together the cornstarch and sugar. Add the egg yolks to the sugar and beat until it is creamy and mostly smooth. Set aside. In a medium-sized pot, heat the half-and-half over medium heat and slowly increase to medium-high heat. Stir occasionally with a wooden spoon, making sure to scrape the bottom of the pot. When ample small bubbles form, but is NOT BOILING (the milk will burn if you let it boil), turn off the heat and in a slow drizzle, pour a scant amount of the hot half and half into the egg yolk mixture, whisking the mixture so the eggs do not curdle. Slowly and gradually add another drizzle/stream of the cream and stir. Repeat the process until all of the hot half-and-half has been incorporated into the egg mixture. You are tempering the eggs so that they slowly heat up. This way you avoid curdling (scrambling) your eggs. Pour the hot egg and milk mixture back into the pot and heat over medium heat again. Whisk constantly until it has thickened considerably (about 4 minutes). The mixture should amply coat the back of your wooden spoon when thickened. Stir in your chocolate and butter until smooth. Add the cocoa powder and vanilla and whisk together. Push the chocolate mixture through a sieve into a medium-sized bowl. Cover with plastic wrap, fitting/pressing the plastic wrap against the top of the pudding, not the bowl itself, to eliminate “pudding skin”. Refrigerate for an hour. It will continue to thicken while cooling. 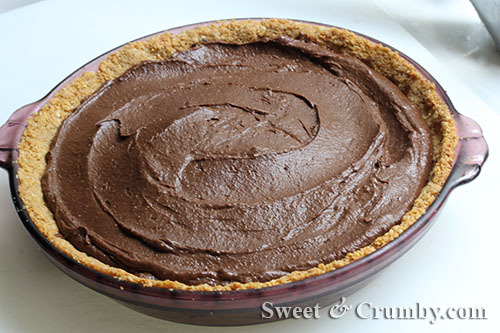 After refrigerating, pour the pudding mixture into the crust. Refrigerate until ready to serve. When ready to serve (or up to 1/2 hour ahead), make the whipped cream. Have chopped macadamia nuts and shaved chocolate ready to go to garnish pie. To make the whipped cream: Whip one pint of heavy cream in the bowl of a stand mixer fitted with a balloon whisk, or use a hand beater and a large bowl. Whip on medium speed at first, gradually increasing the speed to high as it thickens. Once it is thick and soft peaks form, add sifted powdered sugar, one tablespoon at a time, beating in between additions. Beat until stiff peaks form. If you want to pipe the whipped cream onto the pudding instead of spreading it over the pie, simply scoop half of the whipped cream into a prepared piping bag fitted with a GIANT star tip. Pipe from outside in. Then refill bag with last half of whipped cream and finish the piping. Top with chopped macadamia nuts and shaved chocolate. Glad you brought back a piece of tropical heaven in your pie! Well, i am very jealous of where you live my dear. A slice of tropical heaven is always a good thing though. Yes, I can’t think of a better souvenir than something delicious that I can recreate to “bring me back”. Thanks John! Nuts, chocolate…that’s my ideal kind of afternoon snack after a nap 🙂 This looks divine, Geni. It is definitely the kind of snack that will make you feel quite lazy, but it is worth the indulgence. Thanks Angie! Wow! I like your bloggers note and can totally empathize. I always feel like a dork making everyone wait until I get a couple or ten photos. I’d love to go to Hawaii some day but maybe this amazing pie would hold me over until then. I have pretty much stopped worrying about photos beforehand lately and boy have my photos suffered but I am now less stressed when I am baking and have gotten back to the literal “Joy of Baking”. So glad you stopped by Janna. I truly did enjoy my memories while eating this crazy rich cake. Thanks Karen! Noooo, this is a paradise!! I would taste your pie, this seems really good! Awwww, thank you so much for the kind words Sensezia. I would love to give you a taste of the pie. Wish I could send it through cyber space. That looks really awesome! Im not much of a chocolate kind of guy but ill gladly have a piece of that! What a compliment from a non-chocoholic! I would gladly share. Ok with no vacation plans this year I think this is as close as I can get to Maui! I do believe this pie could make you feel like you were on vacation Sawsan. Let me know how it goes! We went to Maui for our honeymoon in Oct. 2011 – I love your game and want to play it!!! What a great Hawaiin inspired recipe! What a nice honeymoon! My husband and I went to Kaui 20 years ago for ours and we are still going strong so maybe that Hawaii vibe is a great way to start. I do hope you play my game and get whisked back to Hawaii…even if only in your mind. I can almost picture you doing the hulu dance from here! This is one mouth watering aloha experience. Loving that ingredient list. I am glad I am not the only one that has bites out of the food in their photos. With hungry teenage boys, I am so lucky that I can get any photos at all. Most of the photos I do get, I cannot use, as they have hands in it going for a taste test. You don’t want to picture my kind of Hula dance Bam. Trust me on that one (think Elaine’s dance from Seinfeld if you were ever a fan). Not pretty. But I can bake a mean pie. 🙂 Yes, pics around teens are almost impossible. They are almost worse than my Golden Retriever whose nose seems to get in many photos. Glad you had a great time in Maui–I’m extremely jealous!! I’ve only been once, and that was back in 2001. I gotta get back out there. And oh wow, this pie is awesome. I’m not surprised it was gobbled up! Yum! Great way to keep that Aloha spirit going! Um. Chocolate macadamia nut?? I just died and went to Heaven. Definitely making this soon!! Oh Hawaii! Miss A mentions Hawaii on nearly a daily basis. It got in her blood. It got in mine too! How could it not. This is a great way to bring a bit of the islands to the kids. 🙂 I hope you had a fabulous time Geni! How did the graduation and all the celebrations go? Was thinking of you this month. Hope you’re enjoying a great summer! Definitely going to have to make this for my Aunt who adores macadamia nuts. Looks fab Geni!! WOW! What a glorious pie! I must make it. Thanks for the recipe! This could very well end up being the first pie I attempt, or possibly the second but definitely makes me want to reach into the screen and take a spoonful for myself. Also love the tips on making it a full Island Paradise getaway at home, could come in handy when the “Holiday Blues” set in! It’s actually a good one to start with since the crust is so simple and doesn’t need to be rolled out. If you can make a pudding, you can make this pie. It has several steps but all are do-able. Let me know if you try this and how it goes. That makes both of us Raymund. It is long gone and I am still dreaming of it. It was quite a pie. Thank you for stopping by. I’ve never been to Hawaii so I think i need to get some aloha spirit into my life. This pie is GORGEOUS. Oh My Gosh. This chocolate pie has me drooling from one side of my mouth to the next LOL. I can not help it. If I had this right now, I would not want to share AT ALL. Aloha! Maui again? I am so jealous…and yes, this pie sure brings the island mood…looks delicious, creamy and filled with all the goodness I can imagine Ina pie. A very very yummy pie. 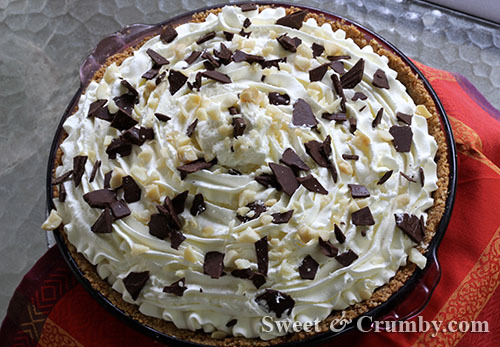 Thank you very much to you give me here wonderful recipes to Iftar dinner in the Table Dining Room Menu Planner Save my time i really like this yummi taste recipe..
Mahalo plenty for posting such a decadent macadamia chocolate cream pie!! Living on the West Coast, we go to Hawaii frequently & love it so much there… its like a 2nd home for us (we own a timeshare there & can trade to go to anywhere else) But for me, Maui No Ka Oi!! Your pie sure took me right back to sunset dinners (and desserts) in Lahaina and elsewhere. We went to the Big Island this past May – but can’t wait to go back to Maui (by the way… your crust here knocks my slippahs off!!) 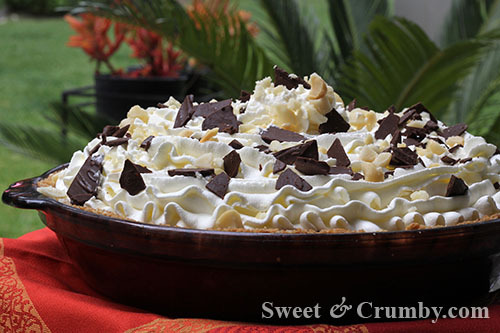 This dessert would sure make the perfect ending to a mainland weekend luau! Happy Aloha Friday! I just came back from Maui and I too went to Leoda’s and was SO disappointed in the pie that I was eagerly anticipating. I thought the chocolate cream was instant jello pudding! NOT at all was I expected. It was terrible. What size pie pan works best? Just starting on the pie for a dinner party tonight. Hi! I definitely have to make this for my husband, as we are suffering from “Leota’s Withdrawal” from our trip last week to Maui and Kauai. I just don’t understand the step about pushing through a sieve. Do you have any photos to show this step so I don’t mess it up? Can I use what I call a “spider” for this step? It’s a tool with lots of tiny holes in it. Thanks! So sorry for the very late reply. Yes you can put it through your “spider”. If the holes are very fine, you may have a little trouble getting the custard through but just keep using a rubber spatula or other similar tool to keep pushing it through. 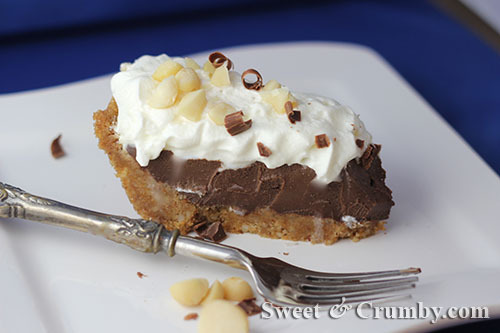 My sister loves chocolate macadamia nuts and pie so for her birthday this is the perfect recipe. I love that you mention even making your own whipped cream by whipping one pint of heavy cream until soft peaks. The only thing I would change/add to the recipe is using actual chocolate covered macadamia nuts instead of chocolate and nuts. You could just chop the already made ones. Thanks for the recipe, I hope, my sister loves it. Craving the MacNut chocolate pie from Leoda’s. Excited to try this out! Mahalo! Let me know how it goes! I love this recipe and hope you do too.